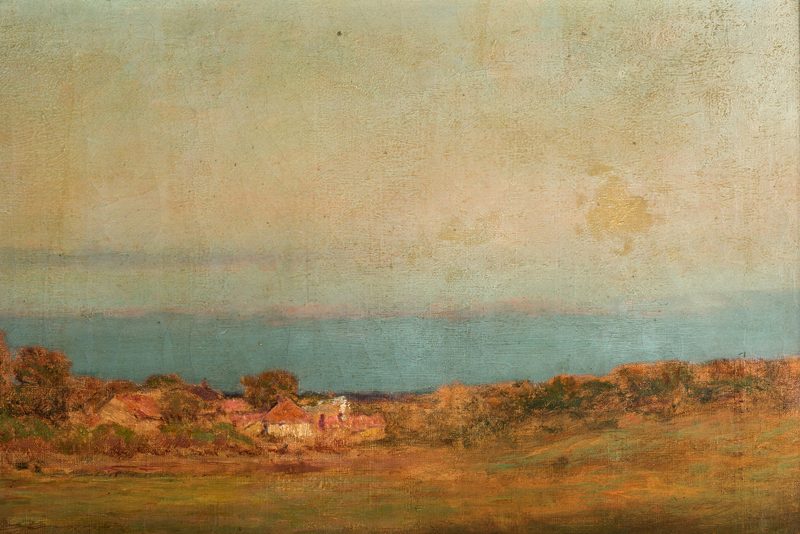 Lot 468: Henry Dearth, O/C, "Autumnal Hues"
You are here: Home >> July 14, 2018 Historic Summer Fine Art and Antiques Auction >> Lot 468: Henry Dearth, O/C, "Autumnal Hues"
Henry Golden Dearth (American, 1864-1918) oil on canvas luminist landscape titled "Autumnal Hues" depicting a group of structures and grove of trees set between a broad horizontal expanse of grass and a clouded sky. 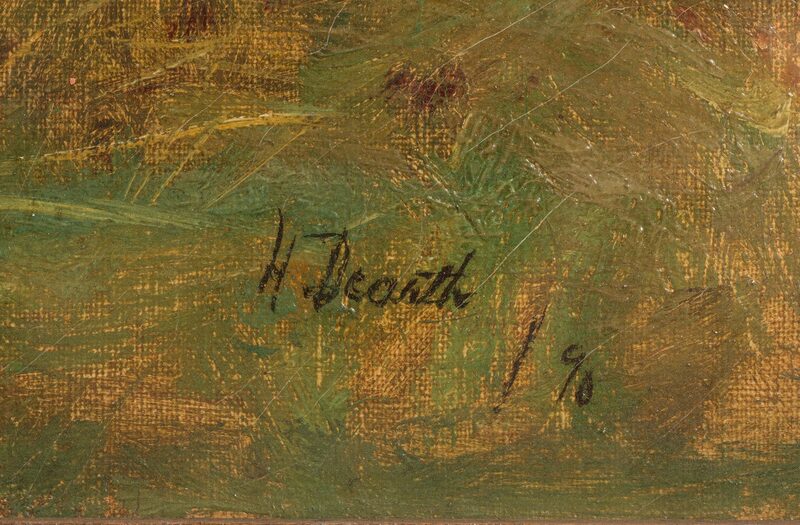 Signed "H. Dearth" lower right. 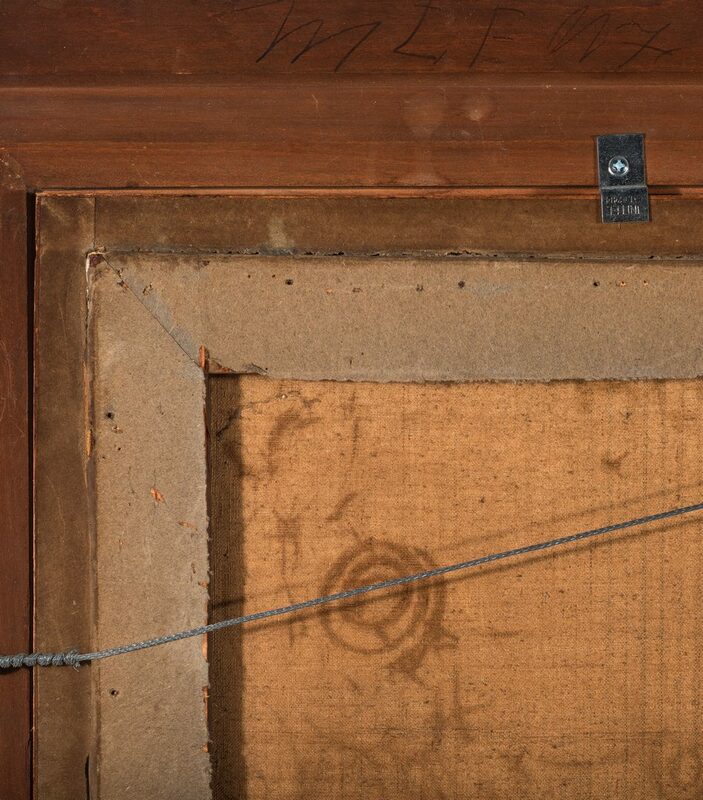 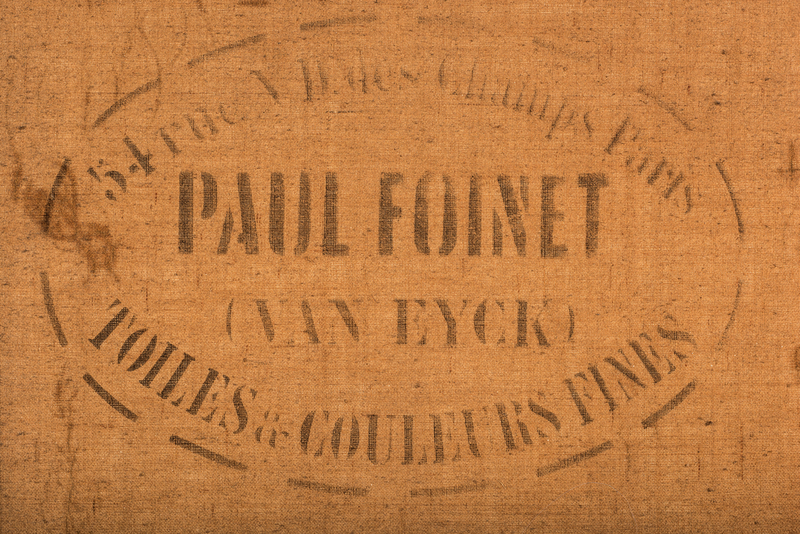 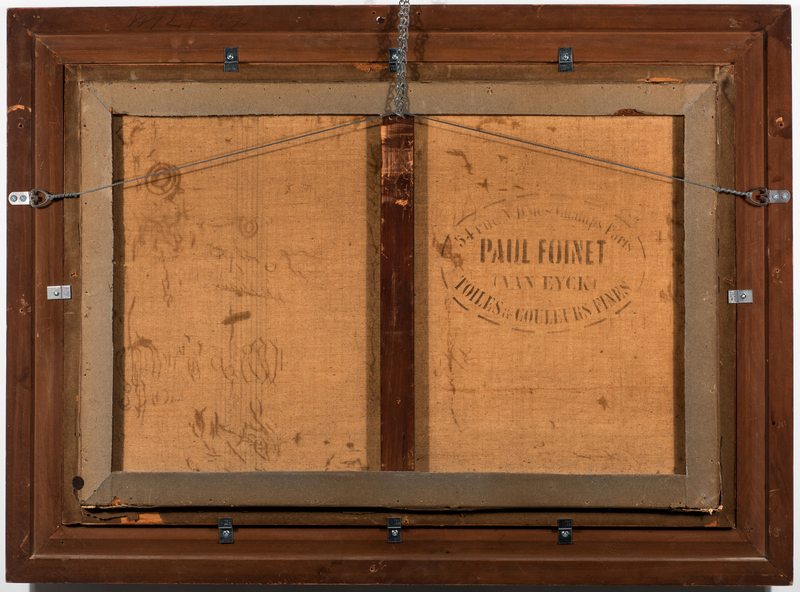 Paul Foinet artist supplier stamp en verso of canvas; back board with M.A. 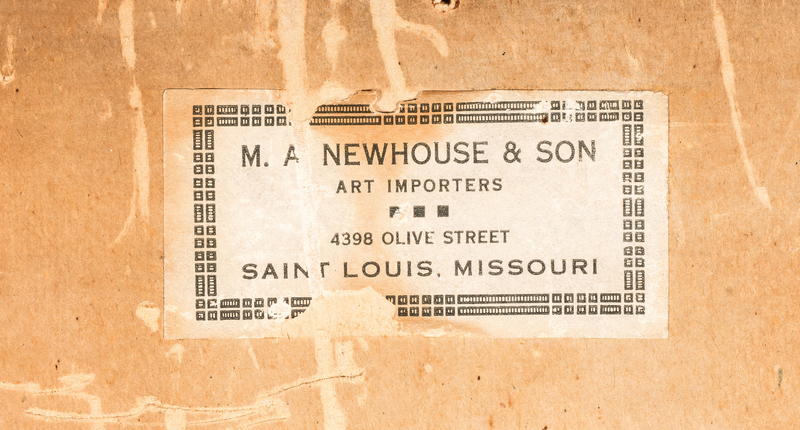 Newhouse St. Louis paper label. 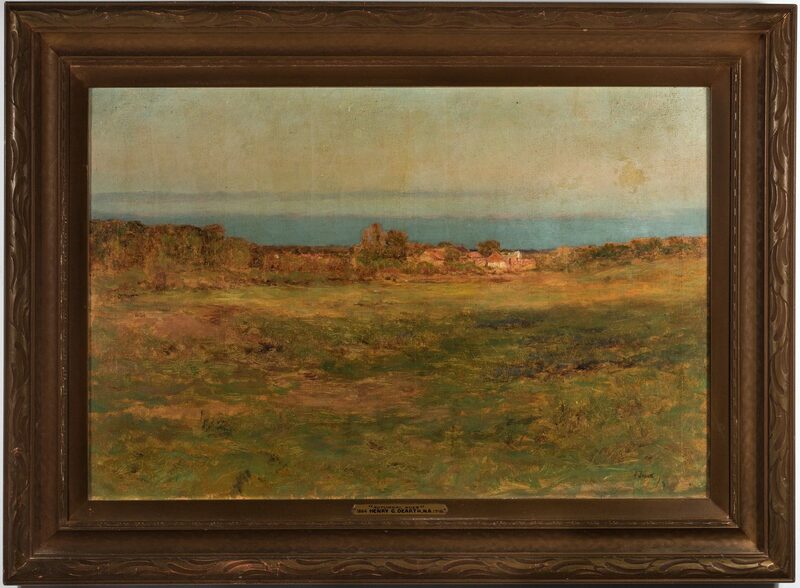 Framed under glass in an early 20th century giltwood molded frame. 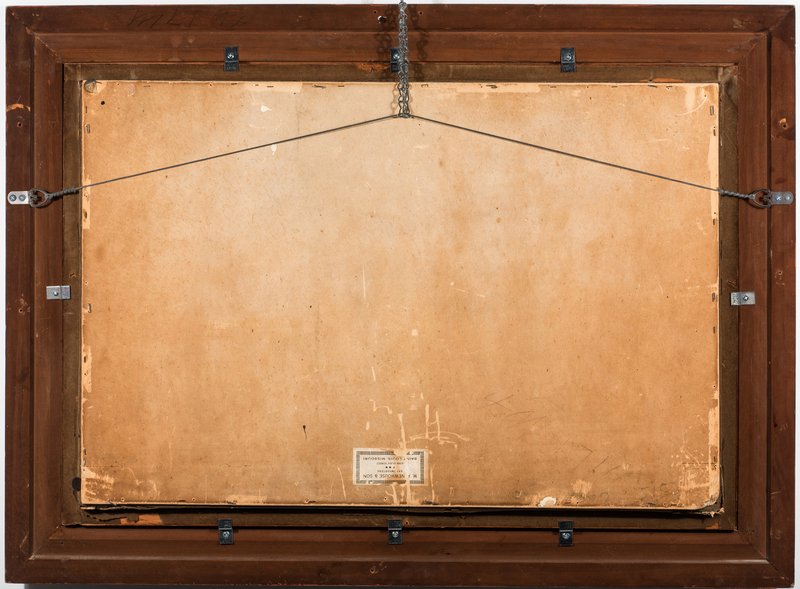 19 1/2" H x 30" W sight, 27 3/8" x 37" framed. 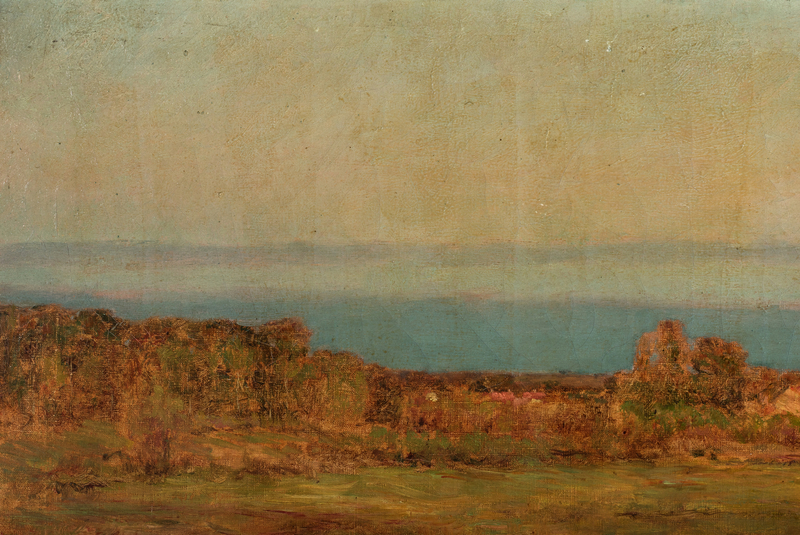 Provenance: the collection of James E. Cowan (1858-1930, whose partial collection formed the basis of the Cowan Collection at the Parthenon Art Museum in Nashville), by descent to current consignor. 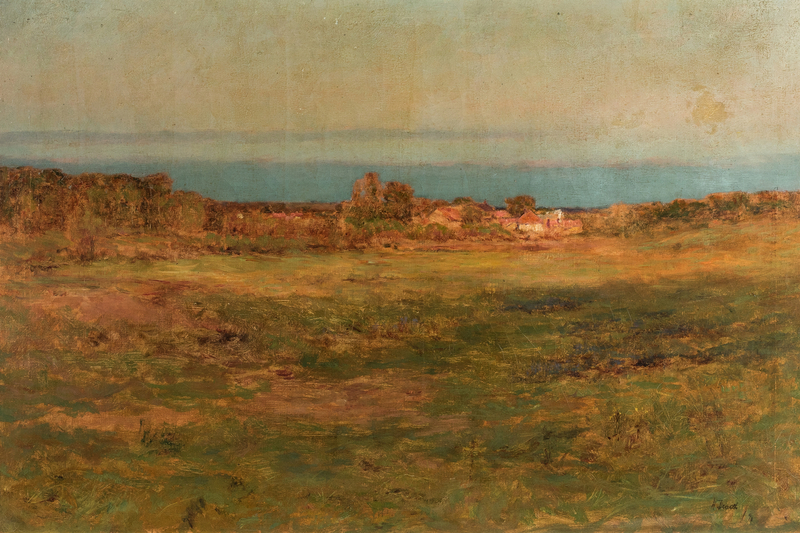 Biography: Henry Golden Dearth was a distinguished American painter who studied in Paris and continued to spend his summers in France painting in the Normandy region. He would return to New York in winter, and became known for his moody paintings of the Long Island area. Around 1912, Dearth changed his artistic style, and began to include portrait and still life pieces as well as his paintings of rock pools created mainly in Brittany. 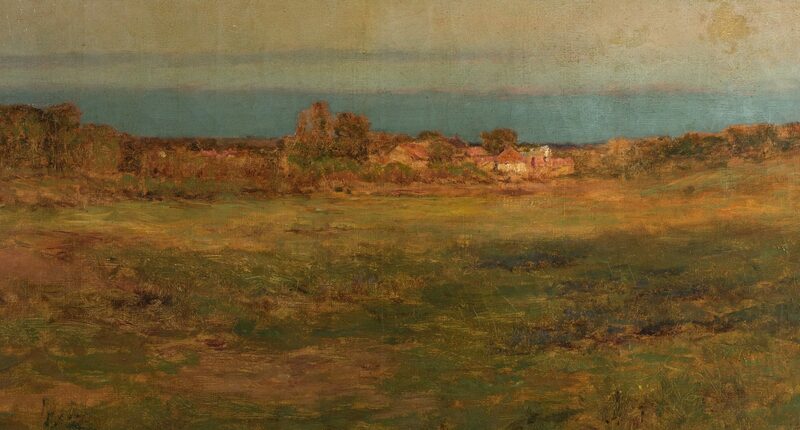 A winner of several career medals and the Webb prize in 1893, Dearth died suddenly in 1918 aged 53 and was survived by a wife and daughter. 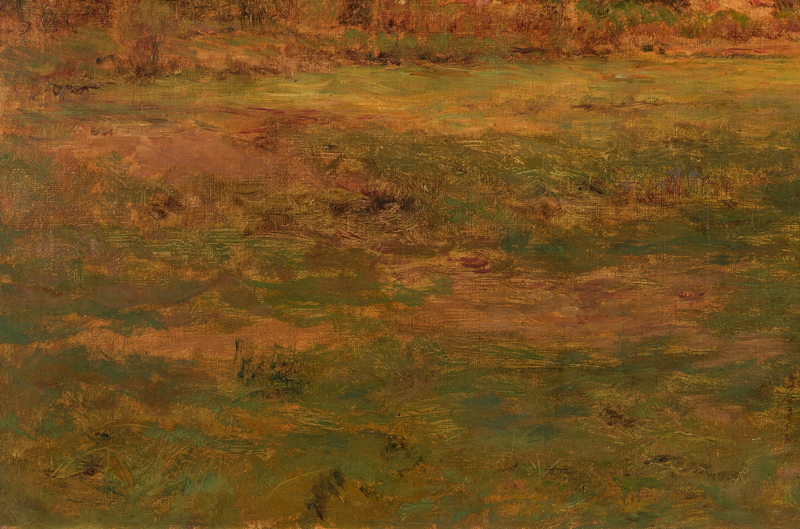 (For additional reading, see: Peter Bermingham, American Art in the Barbizon Mood, National Collection of Fine Arts (U.S.), Published for the National Collection of Fine Arts by the Smithsonian Institution Press, 1975.) 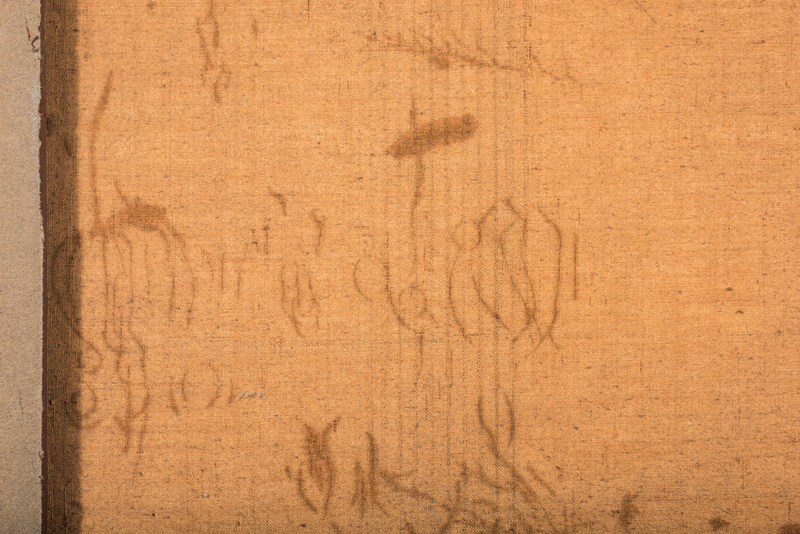 CONDITION: Significant overall cracquelure with area of inpainting top right side, approx. 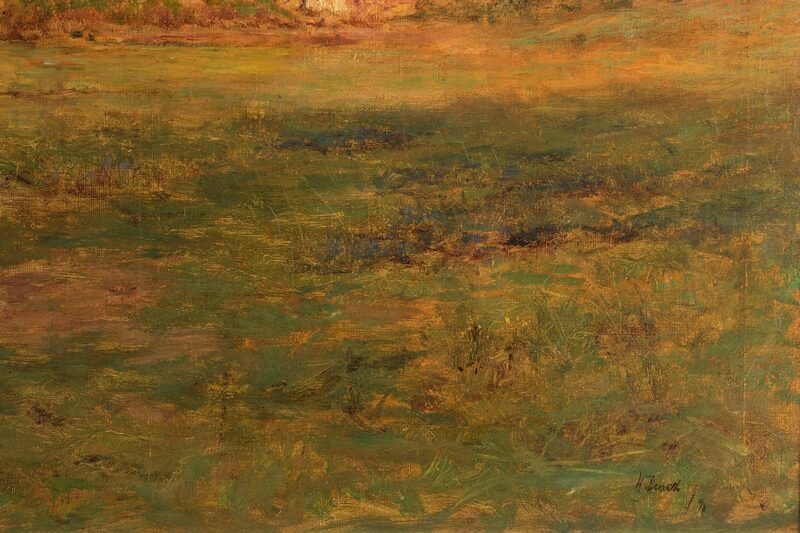 1 1/2"L.